Oxygen Cloud allows you to easily make your own shared folders accessible via the internet. It allows you to blend your own storage devices with storage provided by Oxygen itself. Management of accounts in Oxygen is centralized. Administrators can add new users by email inviting them. 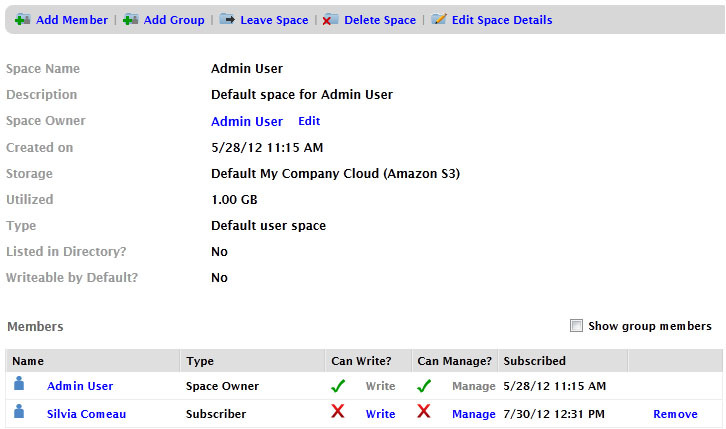 Existing user accounts can be disabled or deleted. Oxygen maps what it calls the “Data Grid” to the “O” drive on Windows. Presumably it uses some appropriate mount point on Mac OS X and other Unix like platforms. The local drive mapping/mount point is actually backed by local storage. Changes are then synchronized with the server. When a user is deleted the client software on that users device will delete the temporary storage backing the drive mapping. That’s great, because when a team member leaves the files disappear from his devices. Of course, the files could be recovered by low level technical means, and the user can copy files to another location that isn’t managed by Oxygen while he still has access to them, but it’s better than nothing. 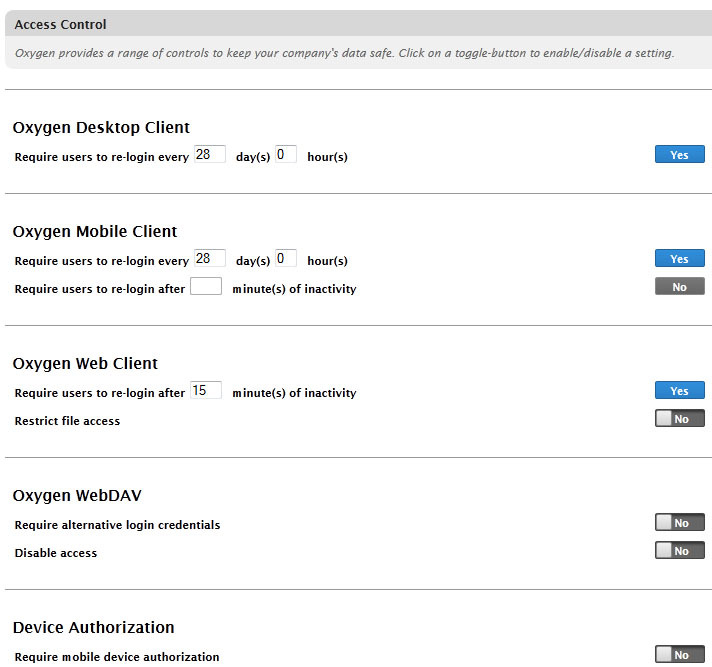 Oxygen also supports single sign on with Active Directory integration, however it’s not cheap. Session timeouts can be managed as well. Revision control is supported and deleted files can be recovered. Permissions are straight forward with Oxygen: Read Only or Read/Write. Permissions are assigned to Oxygen “Spaces”, which are roughly equivalent to a shared folder in Windows. In addition to read/write privileges, it’s possible to grant a user permissions to grant access to other users. Oxygen has good platform support, including Windows, Mac, Linux, iOS and Android. Making a local backup of the data in Oxygen managed spaces is straight forward. Just grant the user making the backups access to everything and back up the Oxygen drive to another filesystem. Further testing of revision control in Oxygen reveals that when conflicts occur the last save silently overwrites the prior save. As there is no notification, users will have no way of knowing when they clobbered another user’s changes. You can still restore clobbered versions of files in the web interface, and it will create a copy like this: Filename (Version X). This behavior is not as useful as how Dropbox automatically renames files. Box.com looks pretty good, but since they don’t provide a demo account unless I sign up with a credit card number that will be automatically billed I won’t be reviewing them. Too many companies ask for credit cards and promise you can cancel, only to make it extremely difficult to do so. There is no valid reason to use this billing model since box.com can shut off the account at any time. I’d rather pay $5 to have an account for a week than have to risk going through a cancellation process.